Following a stellar sold out performance at Hoxton Hall last month and a dazzling performance at this year’s Great Escape Festival, Samm Henshaw marked his highly anticipated return. Hailed for stardom, the singer-songwriter has spent the past 2 years working and touring with the likes of Pharrell, Chance The Rapper, Rag’n’Bone Man and Maverick Sabre before kicking off this current chapter of his bright career. Canadian based duo Garçons (singer/songwriter Deelo and record producer/director Julian Strangelove) first met in 2014, but didn't start working together until last summer when they dove into writing and recording. Inspired by the bohemian rap lyricism of Pharrell and Q-Tip, Nigerian born Deelo found a perfect collaborator with Strangelove, whose Soul meets Reggaeton beats provided the perfect vehicle for Deelo's vocals. Their forthcoming debut EP "Body Language" was written over the course of a month in Strangelove's Ottawa apartment. "There wasn't a goal, we just wanted to make good music," Strangelove says of the experience. "At the end of the day, the music is really all about embracing uniqueness and the things that make us human - love, nostalgia, euphoria, insecurities, lust, boredom, etc." 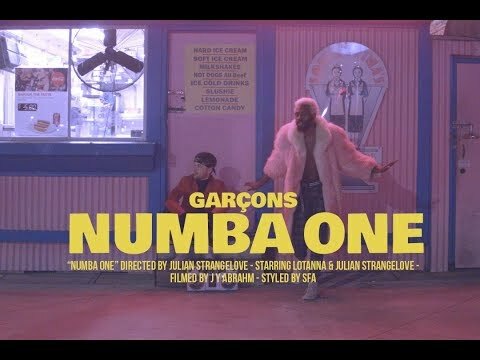 Garçons' fusion experimentalism comes through in their debut single "Numba One," which comes with a rainbow pastel music video. Directed by Strangelove, the clip was filmed in Ottawa and pays homage to Quentin Tarantino through highly stylized characters and lush visual acrobatics, with Deelo taking a page from Andre 3000's style donning bright pink mink body duster and plaid pants, toying around with a '90s boom box and bright green vintage car, as the duo visits some local haunts including an arcade and the famed ice cream (aka "creme glacée") joint Lois n' Frima's. 'With the music & the visuals, it's always been about telling stories and creating this colorful world for people to get lost in." 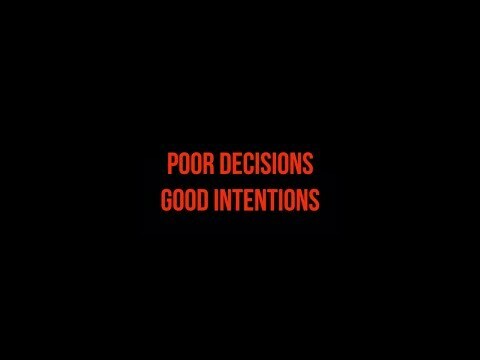 This song is the basis for King Khali's newest EP release, "Poor Decisions, Good Intentions" on May 25th, 2018. It tells the story of going to jail, for hitting a lick to pay his sick mother's rent so that she didn't get evicted. Who among us hasn’t wished he or she could gaze at the stars during daytime? To get lost in the rhythms of nature, and slip into a waking reverie? To find something that might help you transcend the limitations of the hectic world around you? Well, Lady Moon & The Eclipse have what you’re looking for. Theirs is spiritual music in the truest sense: they make pop, R&B, and Afrobeat that feels like a window into a more tranquil, ethereal dimension. The group has become one of the most reliable suppliers of musical illumination in Brooklyn – stars of the club circuit, dazzling live performers, and record-makers of grace, elegance, and positivity. Journey to the Cosmic Soul, their latest set, is an aural daydream in the best sense. Everything about it is suffused in beauty. “Star Gazing”, the single from their forthcoming album, Journey to the Cosmic Soul, is a glittering example of everything that Lady Moon & The Eclipse does so well. The rhythms are gently propulsive, the electric piano is playfully funky, the synthesizers tug and whir, and support singers Nkoula Badila and Ntangou Badila bathe the track in gorgeous harmonies. The lyrics are heady, witty, inspirational. But the true star of the show is Lady Moon herself, who, without ever being too showy about it, sings with uncommon precision and confidence. She’s got wisdom to share, and she delivers it with a beaming smile. The band and backing vocalists act as the Sun, bestowing light upon Lady Moon, while the audience is the Earth; when the three are in alignment, the Eclipse occurs. That look of glee is front and center in Jonah Best’s radiant clip for “Star Gazing”. So, too, is Brooklyn, its brownstones shining in the spring sun. Best, an experienced director, has become a specialist in urban cinematography: he’s made dazzling videos for Fresno rapper Fashawn and New York soul duo Oshun, and in both cases, he captured the essence of the cities where he filmed. Here, he does the same – he brings out Brooklyn as a place of magic and wonder, enchanted, overflowing with color and light. Lady Moon and her band-mates are part of the spell: they dance and sing with utter exuberance on the front stoop of their apartment building. And we follow them into the woods, where the six members of the group stare in awe at the canopy of leaves in another dimension. Their rapture can be yours, too. All you have to do is press play. Fresh off the heels of his latest visual, Train Of Thought picking up traction online and having a stint of going viral via popular platform UNILAD, London based rapper, AKS, keeps up the ante taking to the stage at the prestigious Sofar Sounds, which has played host to budding talents in intimate shows across the world as well as UK juggernauts. The likes of Emeli Sande, Lianne La Havas, Gregory Porter, Rag’n’Bone Man, & Ed Sheeran (to name a few) have all graced these stages and now we see AKS join the ranks of brilliant artists the platform has taken a shining to. Accompanied by the amazing live band that’s seen him be championed across London’s live circuit, the three letter man delivers an emotionally charged performance of “The Dialogue (Talk to Me)” which appears on his Unsigned Music Award nominated “ Train of Thought EP ”, released last May. Impassioned lyrics abound in this gripping performance as AKS painfully explores themes surrounding societal pressures, struggles with mental health, the feeling of being alone and the use of his music as a therapeutic outlet. It’s clear that raw emotive delivery is fast becoming AKS’ trademark calling card and there’s heaps of it here in this soul stirring performance. A definite must watch. LA On Lock Radio: Episode 18 feat. TresDeka. Hosted by Pookie F'n Rude & Macharo. Music mixes by N3 On The Track. Tune in below. LEAN is the first single off of JEN DALE's upcoming album, CLOSER DISTANCE, due to be released early 2018. In the months to come she will be smoothing over the wait, by releasing 3 more singles before the album drops! Check out the Behind the Soul video on the evolution of Eamon's Golden Rail Hotel . R&B/Soul singer, Eamon, probably best known for his 2003 hit “F**k It (I Don’t Want You Back)" returns with a soulful new song and video aptly titled “I Got Soul” that is steeped in late 60’s-early 70’s homage. Eamon brings viewers into his chaotic but fun-loving community at the Golden Rail Motel in a sweeping single-shot video deftly directed by Doug Quill. “I Got Soul” was produced by Eamon and Dan Ubick (Connie Price & The Keystones) with co-production by Stoupe (Jedi Mind Tricks) and additional production by Steve Kaye and appears on Eamon’s first new album in over a decade, “Golden Rail Motel,” out September 15th. Eamon delivers a fiery collection of new material, an album soaked in soul that plays like a modern soundtrack to a bygone era of music making. After selling millions of records worldwide and hitting #1 on the charts in over 40 countries, Eamon returns with a renewed passion on his upcoming full-length LP, Golden Rail Motel. The LP not only signifies a return of one of R&B’s most powerful voices, but also marks a new chapter for Eamon, both personally and professionally. An early onslaught of fame, money, and all the trappings of instantaneous, worldwide success led to hardships and struggles for the young Eamon, and his demons almost derailed his very promising career and life—a journey that is captured on the album. The classic blue Impala nearly steals the show in this beautifully shot Hip Hop & Soul collaboration that's sure to "Change The Frequency" of the mumble rapping that has infiltrated the genre. Revered for her “her willingness to stand naked lyrically and vocally,” (Austin Chronicle), “few can put together the total package of eclectic, soulful jams and a stridently powerful voice the way that Jackie Venson can." (Texas Monthly) The guitarist/songwriter will bring a fresh sound to Transcends and the upcoming tour with Gary Clark Jr. Stay tuned for the first single from the new EP and more exciting news. Premiered by DIY Magazine earlier today, British songstress Mahalia has unveiled the hazy video to accompany her stunning first official single “Sober”. “A hazy, booze-fuelled wander through the remnants of a house party, the video perfectly encapsulates that early morning wooziness” quotes DIY. The track; a rich slice of R&B that recalls the likes of Erykah Badu, Sade and Lauryn Hill, is sprinkled with originality and pushed into the present day. “I’m sorry that there ain’t no time left, you and I are over, me and you are done,” she sings, her warm tones melding into the illustrious, groove-laden beat, her words hitting straight to the heart. The track is quintessentially Mahalia – encompassing the classic sounds of the past while refusing to be hemmed in by one particular genre; her open-hearted lyricism holding it all together like magic dust. “Finally! I've been waiting to share this with you and now I can! Here's the video for my debut single #SOBER. This story is totally about the morning after. Thinking about the night before - all the mistakes you made, all the muddled texts you sent. I always talk about how this song is a representation of realising a situation is not good for you and getting yourself out of it. This is me waking up and smelling the roses. Now that I am sober..."
At 12 years old – the age most of us are aimlessly riding bikes or trying to avoid homework – Mahalia was picking up a guitar and penning love songs. With her entrancing, soulful tones, wise yet relatable wordplay and intuitive sense of melody, it quickly became clear that she had a natural sense of musicality, and that she’d be doing this for the rest of her life. Now 19 and based in Leicester, Mahalia is ready to fully unleash what she’s been brewing into the world. In the time since she first picked up that guitar, she’s dropped a scattering of releases – from 2012’s indie-flecked acoustic dream “Head Space” to 2015’s gorgeously understated 4-track EP “Never Change” – which was premiered on i-D – and last year’s genre-flipping mixtape “Diary of Me”, picking up praise from the likes of The Independent and MTV. In 2015, her unique voice caught the attention of Rudimental, who asked her to feature on their easy-going summer anthem “We the Generation”, pushing her name to a wider audience in the process. But for Mahalia, it feels as if she’s just getting started. Premiered by The FADER and produced by Maths Times Joy, British songstress Mahalia has unveiled her stunning first official single in the form of “Sober”. The track is a rich slice of R&B that recalls the likes of Erykah Badu, Sade and Lauryn Hill, yet is sprinkled with originality and pushed into the present day. “I’m sorry that there ain’t no time left, you and I are over, me and you are done,” she sings, her warm tones melding into the illustrious, groove-laden beat, her words hitting straight to the heart. The track is quintessentially Mahalia – encompassing the classic sounds of the past while refusing to be hemmed in by one particular genre; her open-hearted lyricism holding it all together like magic dust. Baldwins is an eight-piece progressive-soul band hailing from Sydney, Australia. Combining elements of soul, jazz, and rock, the band have developed a distinctive sound with lush jazz-tinged harmony and dense polyrhythmic writing. A multitude of eclectic influences have informed the band’s sound – a genre they themselves call ‘progressive soul’ – which takes cues from such neo-soul/hip-hop artists as Thundercat and D’Angelo, the textural composition of producers such as Taylor McFerrin, as well as influences from alternative artists such as Radiohead. All of these inspirations have amalgamated in an unconventional sound that is entirely their own. Dirty Sheets is about the journey we take through the exhilaration of love and lust. The excitement that pumps through your body; the butterflies that lift you, making you feel weightless; and the touch of a lover that melts you in an instant. Then there comes a moment when that exhilaration is stripped away, leaving you confused as to why it has gone or whether you really ever had it at all. Baldwins are set to drop their debut EP in mid 2017.